New SURE Women with dry shield controls underarm sweat that causes odour. So, you feel dry and fresh all day. After bathing , apply 4-6 swipes per underarm to form a white dry shield which will become invisible as you get protected. Let product dry and then wear cloths. Use every day. Do not apply on broken skin. If irritation occurs discontinue use. Water, Aluminium Chloro Hydrate, Steareth-2, Helianthus Annuus (Sun flower seed oil), Perfume, Steareth-20, Slica dimethyl Silylate, Di sodium EDTA, Pentaerythrityl tetra di-D-butyl, Hydroxyhydrocinnamate. It claims 0% Alcohol i used it with full of confidence on my skin (underarms). It is handy to use easily and I use to apply as per the instruction given in the pack. When I apply it seems a white slight creamy liquid and takes few minutes to dry. I have to wait for sometimes to wear cloth. It has not that much fragrance. Still controls sweat well. It is good and does what it says. Controls sweat for 4 to 5 hours for me. As I am not in an AC room and working in Kitchen most of the time. 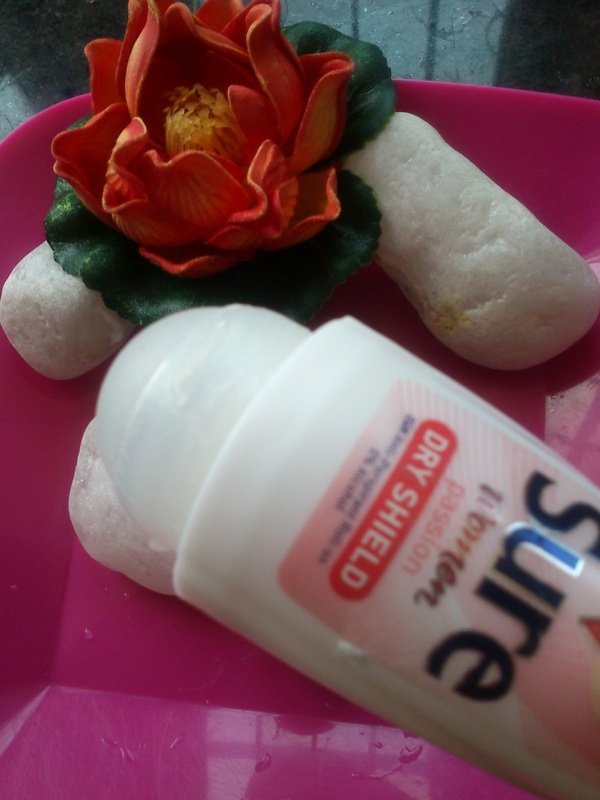 This New SURE Dry Shield Passion Roll On never causes any irritation or allergy. I feel safe to use it on my Skin as it is alcohol free. The roll on never stuck on the skin and it is smoothly moves to apply the deodorant fast. I never see any white patches because of this roll on. 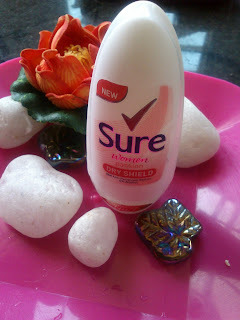 This New SURE Dry Shield Passion Roll On controls sweat during horrible summers very well. This product is very helpful for women who sweats a lot. The only thing after using this product you will need to use a body spray separately as this roll on is not giving any fragrance. 0% Alcohol is a very good one for skin safety. Very handy can carry around in your handbag. Safe to use on direct skin. This Roll on has no pleasant smell. Takes some time to dry after application. It is an affordable roll on which is alcohol free and safe on skin, controls sweat very well, the things is it takes some more time to get dry. 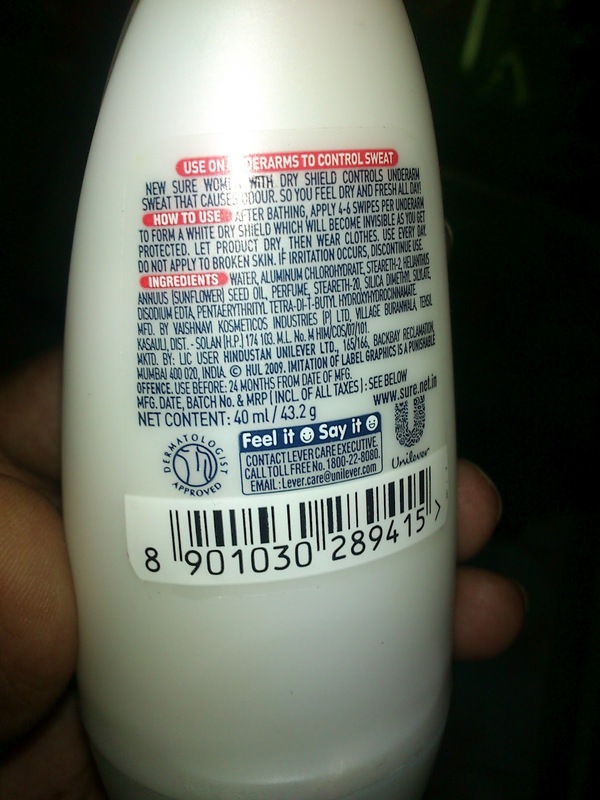 It's more of an anti-perspirant then...not the usual dove or nivea deos kind!